During the Civil War, many military units had their own regimental flags that they carried into battle, and this was true of units in the United States’ Colored Troops (USCT). On the third day of the month, I’ll display a flag from each of those regiments – depending on my ability to find these flags through internet searches and other sources. Source: Library of Congress, LC-USZ62-23096; see here for more information. Almost 2900 Black Jerseymen served as enlisted men in the ranks of United States Colored Troops (USCT) during the Civil War. Even though locally recruited, USCT regiments were Federal outfits. These men served in a number of regiments, most of which were raised at Philadelphia’s Camp William Penn. 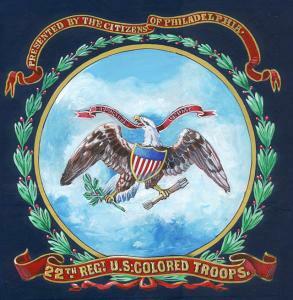 The 22nd United States Colored Infantry (USCI) was organized at Camp William Penn in January 1864. With 681 Jerseymen on its rolls, it was the most “Jersey” of all USCT regiments. 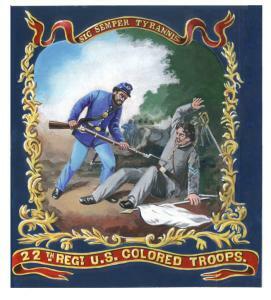 The 22nd USCI fought in 1864-1865 at the battles at Petersburg and Richmond; was assigned to the XXV Corp, the only all Black army corps in United States history; participated in President Lincoln’s funeral procession after General Lee’s surrender at Appomattox; and patrolled the Rio Grande River in Texas to prevent foreign encroachment into the United States through Mexico. More details about the 22nd USCI are at the here at Civil War Archive.com. The flag was designed by David Bustill Bowser, an African American artist who created several USCT flags. View all of the USCT flags on this cite to date by going here. 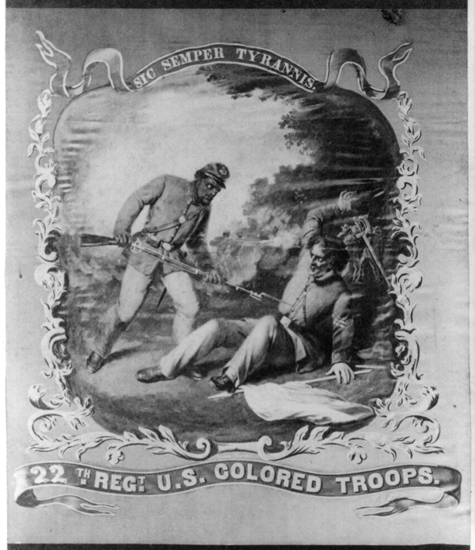 This entry was posted in Regimental Flags, Uncategorized, US Colored Troops. Bookmark the permalink. We sometimes see controversies about what the Confederate soldier fought for, or what the Union soldier fought for. But there’s no doubt about why colored soldiers were fighting. Slavery was tyranny, and they sought to destroy the tyrant’s army. Amazing central scene for the flag. I’m running into a good number of men from the Shenandoah Valley who served in this unit. Actually, I’m finding quite a range of units, and this is one dominant one among them. Looking forward to seeing more images of the flags. Several years ago I found and photographed the US-issued gravestone of a man named Temple Cheeks, a veteran of Co H, 22d USCI, in the Mt Pleasant Baptist Cemetery on Coppermine Road south of Herndon, Fairfax Co, VA.
It’s interesting also to note the “TH” after 22. I wonder if this flag was originally intended for this particular regiment, or if it was intended for a different regiment and was quickly modified to suit the organization of the 22nd.